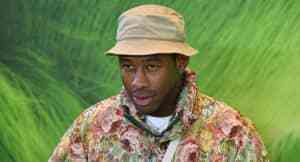 New shoes and clothes from Tyler, the Creator’s line are available April 26. Tyler, the Creator's fashion line GOLF le FLEUR* and Converse will collaborate on another collection of shoes and clothing, this time called "Mono." It will be released online at golfwang.com and converse.com on Thursday, April 26. The shoes come in five new colors: Black, White, Greener Pastures, Limoges and Rhubarb. Check out a selection here, with photos of the white shoes over at Nike. The new kicks are part of a "complete apparel capsule," with tees and sweatshirts also on the way – those will come in Light Grey Heather, White, Green and Limoges.